What will I learn in a dressage clinic? I love helping people and horses to connect and form a better partnership. I believe that almost 90% of all difficulties are related to the rider; whether that is due to a lack of balance, timing of the aids, fear or negative emotions, or the lack of ability to correctly read the horse. The final 10% is usually related to discomfort in the horse, physical issues that create resistance, poor saddle fit, and/or previous negative training. At the beginning of every lesson, I ask the rider questions related to their riding experience. I also evaluate the way the horse is moving and the "vibe" I am getting from both horse and rider as a team. I start first with rider position- is the rider properly aligned? Are they gripping? Are they ahead or behind the motion of the horse? How is their contact? It is my goal to help the rider understand how their position, balance, and aids are affecting the horse. At the end of the lesson, I always make time to answer questions, and I make sure that the session ends positively for both horse and rider. What is required to host or participate in a clinic? To host a clinic I ask that there be a minimum of 6 riders and a maximum of 9. Each lesson is scheduled in 1-hour sessions and I recommend setting aside one half hour before the first rider, so I can introduce myself and briefly review the content. I also enjoy doing a Q & A after, or during, a lunch break to answer questions that may be related to the previous lessons or any other topics, such as bit-less dressage and/or trick training. Please send me an email to beginthedance@gmail.com or connect with me on Facebook to inquire about current clinic rates. I give a discount to facilities within 150 miles from my home in Dover-Foxcroft, ME and I also try to co-ordinate with other facilities to combine travel expenses. I am willing to travel anywhere in the world to teach, but the plane expense will be included in the clinic price. 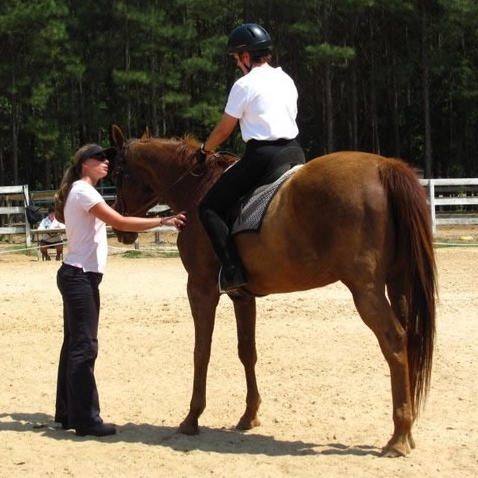 What skill level is required of the horse and rider to participate? I encourage anyone to participate! Whether you are just starting out in Dressage at Introductory level (walk & trot) or working towards Grand Prix, I am happy to help you improve. It is important to start out with correct basics; I feel that I can help lower level riders greatly improve their riding. I also enjoy working with ALL BREEDS, particularly the Baroque-type horses: Andalusians, Friesians, Lusitanos, Lipizzans, Morgans, etc. My teaching and training style is well-suited to emotionally sensitive horses, as I have ridden these types of horses for over 19 years. Many of my clients also ride Quarter Horses, draft horses, ponies, Gypsies, Arabs, Thoroughbreds, Halfingers....you name it! Every horse is a unique puzzle and EVERY horse can be improved with correct Dressage work, no matter what breed. I also work with western riders that are interested in learning western dressage, trail riders who want better balance, and event riders that want to improve their dressage scores. Can I take a private lesson without riding in a clinic? Yes! I regularly teach riders within 1 hour's driving distance from my home in Dover-Foxcroft, ME. I can also take trailer-in's at Elysium Sport Ponies in Atkinson, ME. I do have a busy schedule and usually ask if clients have 2-3 friends that may want to join the lesson, to make it worth everyone's while. I usually teach local lessons Monday-Friday. Please contact me by email (beginthedance@gmail.com) or Facebook to see if I have an available time to schedule a private lesson for you. I prefer to work in an indoor arena, so I don't have to worry about canceling due to the weather, but if you only have an outdoor arena or paddock to ride in, I will make it work. MUST be within 1 hour of Dover-Foxcroft, ME (unless trailering in). Thank you for requesting a private lesson with me! You should have a response to your request within the next 48 hours. Thank you for submitting a request to book a clinic with me! You will receive an email when your request has been reviewed.